What could be better than a batch of oven-warm banana bread muffins? 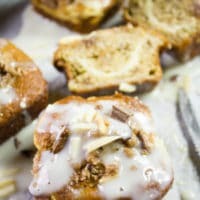 Maybe a batch of banana bread muffins with a rich and tangy cream cheese swirl and icing on top? Can you ever get enough banana everything? 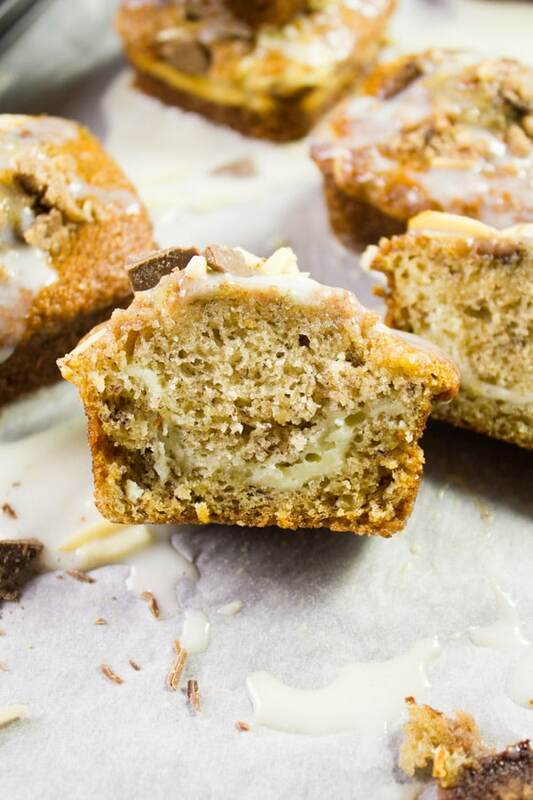 This Cream Cheese Banana Bread Muffins recipe will top your list! 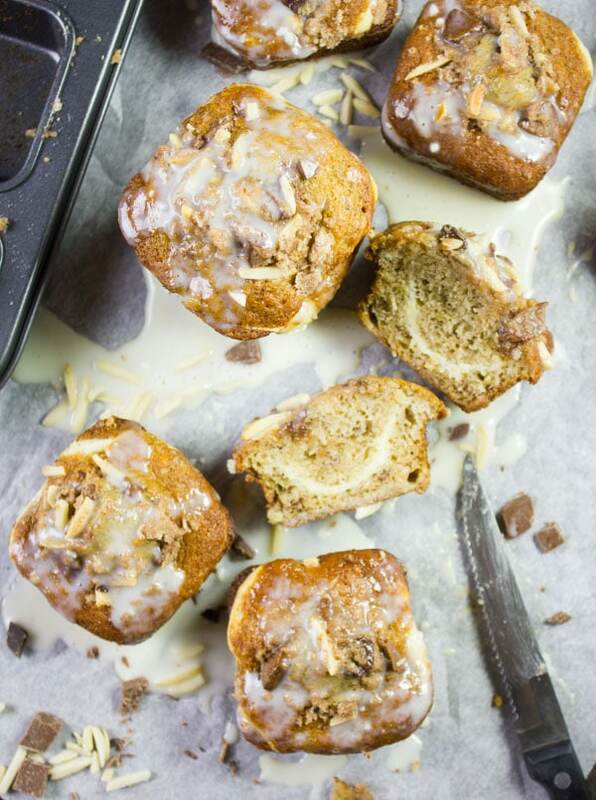 It’s a moist, intensely banana flavored muffin with a rich filling of cream cheese, an almond chocolate chip crunch on top and a drizzle of cream cheese glaze for a perfect finale. Well, it’s certainly a sweet day over here—sweet with a touch of comfort. It’s the type of sweetness that you can’t get enough of. I don’t know about you, but for me—I can only take a tiny slice of a decadent dessert. However, when it comes to a comfort treat like those banana bread muffins, well I can grab a couple with no shame or guilt. So yes, today’s muffin recipe is one of those irresistible things in life. 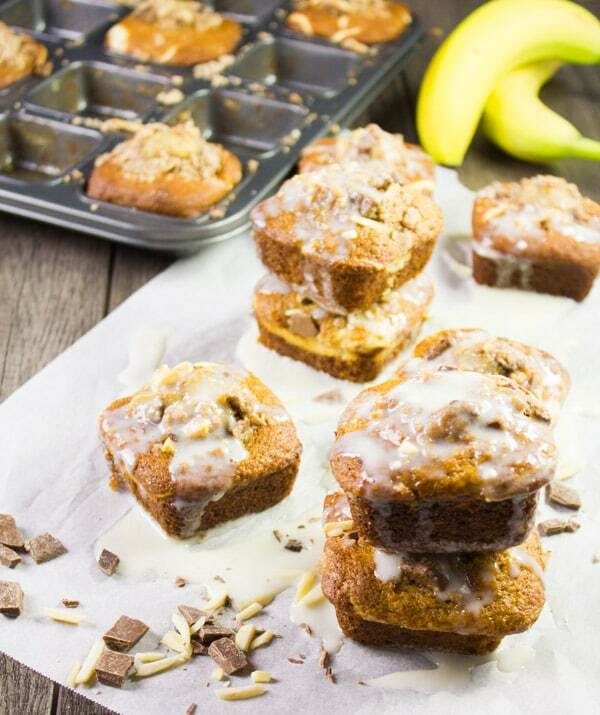 These banana bread muffins are the perfect recipe all year round – perfect for breakfast IMO! But don’t be surprised if you find yourself making it your go-to banana dessert. Think about the creamy dreamy tiny layer of cream cheese, the crunch topping, and the cream cheese glaze. It feels like the best of both worlds and I’ll tell you why. Ok, it starts with the base—the banana bread muffin. If you haven’t made my whole wheat banana bread recipe, you’re seriously outrageously missing out! When you try it, you’ll feel like that’s the one. It’s NOT a dense or oily banana bread for the record, it’s just utterly moist and tender with a slightly fluffy crumb. For me, this is pure LOVE! 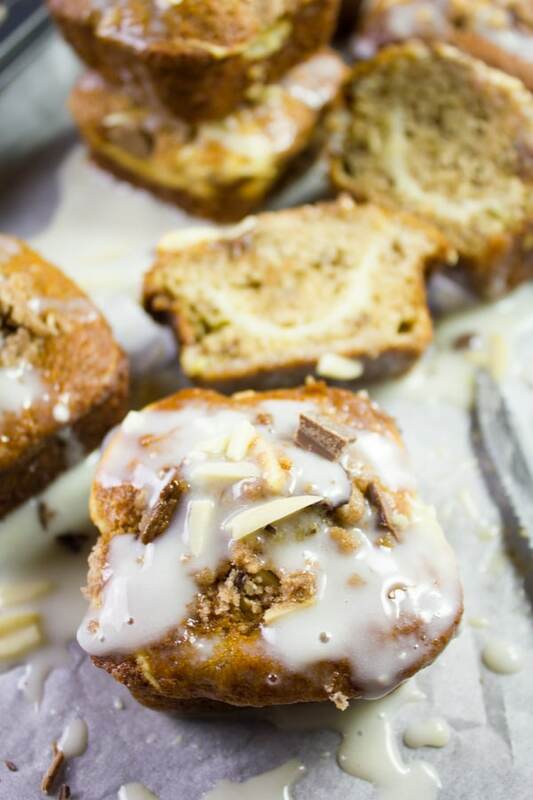 And then comes the cream cheese swirl that just takes these simple banana bread muffins to a whole new level. I have a weakness for cream cheese anything. From something as simple as the best cream cheese icing, to my decadent mini raspberry cheesecakes and this divine cheesecake streusel raspberry cake or these fresh berry citrus poppy seed bars! Start by making my whole wheat banana bread batter. Preheat the oven to 375 degrees F. Prepare the banana bread recipe and divide two-thirds of the batter into a12 regular size muffin pan leaving the remaining third aside. Make the cream cheese filling/glaze by mixing all ingredients in a medium bowl and then divide this mixture into two bowls. To one bowl add one egg and mix well. Dollop a Tablespoon and half (more or less to your taste) of the cream cheese mixture over the banana bread batter in each muffin tin. I don’t want the cream cheese filling to take over the tender fluffy muffin experience, so I go with a really thin layer of cream cheese. Finally that crunch topping. It’s a combo of almonds and chocolate chips with a slightly buttery crumb. 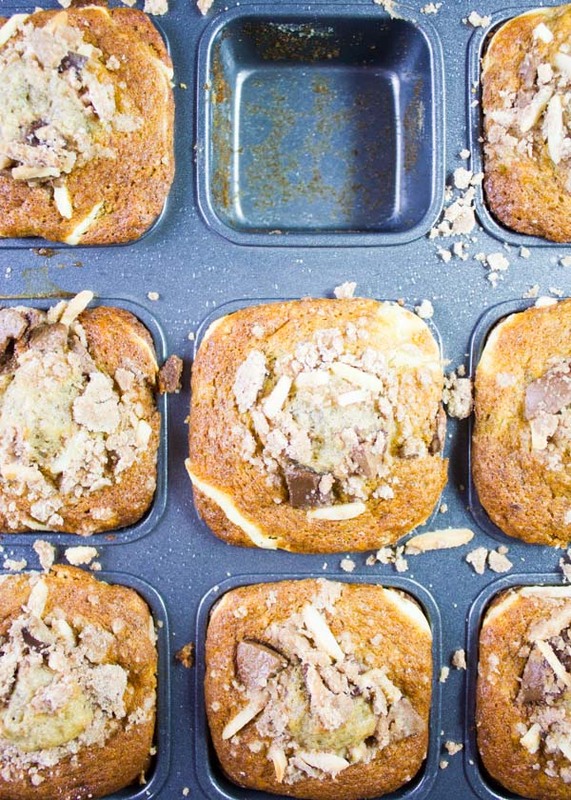 Top each muffin tin with a tablespoon (more or less) of the crunch topping and bake the banana bread muffins for 20 mins. To the remaining bowl of cream cheese glaze/mix, add the milk while whisking it to gradually reach the consistency you prefer. 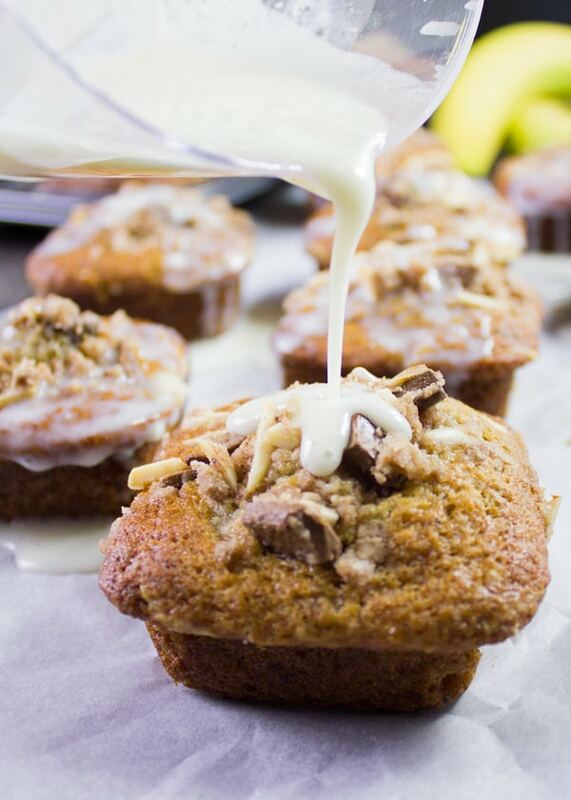 And then I drench my banana bread muffins with my homemade cream cheese glaze. BUT as I always say in my cooking classes, on this blog and everywhere—feel free to stuff your muffins with as much/little cream cheese as your heart desires. Believe me, you can’t go wrong either way. When it comes to the cream cheese filling and icing, I use a simple trick by making a cream cheese, vanilla and sugar mixture. Then I divide that into two bowls, one of them for the filling (to which I add an egg) and the other for the icing, which I thin out with milk. You’ll just need to make these banana bread muffins and see for yourself 🙂 So go ahead and enjoy!! Make sure your cream cheese is at room temperature to allow for easy blending. Add any nuts you want – a single kind or a mix of several. 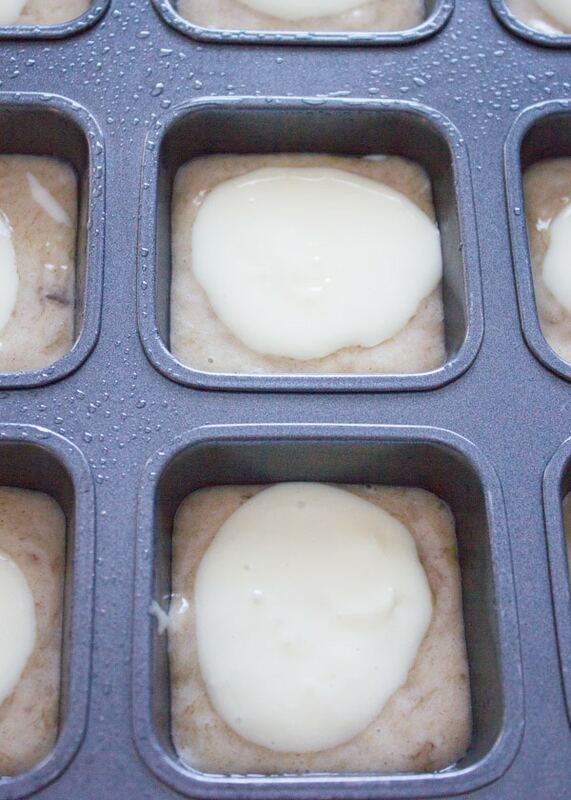 Store cooled muffins in an airtight plastic container. Preheat the oven to 375 degrees F. Prepare the banana bread recipe and divide two thirds of the batter into a12 regular size muffin pan leaving the remaining third aside. To one bowl add one egg and mix well. Dollop a Tablespoon and half (more or less to your taste) of the cream cheese mixture over the banana bread batter in each muffin tin. Take the remaining third of the banana bread batter and dollop it evenly over the cream cheese layer. Make the crunch topping by mixing all ingredients in a small bowl using a fork to roughly blend everything together. Top each muffin tin with a tablespoon (more or less) of the crunch topping and bake the muffins for 20 mins. Add any nuts you want - a single kind or a mix of several. You can double/triple the cream cheese mixture to make the cream cheese filling layer thicker for each muffin. That icing on top really just makes these irrisistable! Wonderful way to start the day! so true Demeter! Do you love cream cheese icing too? 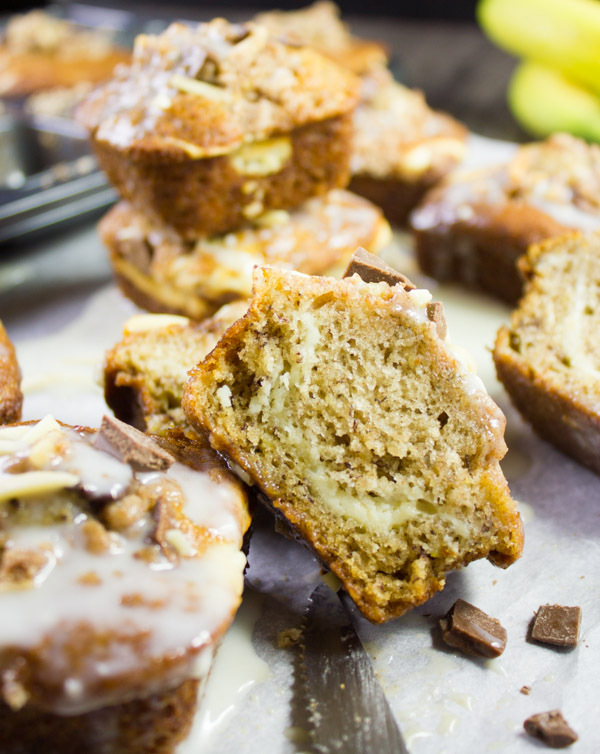 Banana bread muffins sound like the best of both worlds. Love everything about this! Thanks Jacque, Hope you make this soon! These muffins look perfect. Cream cheese and banana is such a great combo, and your presentation is lovely! 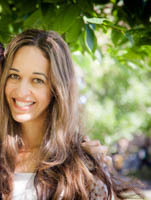 Thanks Chrissie, the combo is so good!! This looks heavenly! Need to make a batch of these, so easy and crazy delicious! 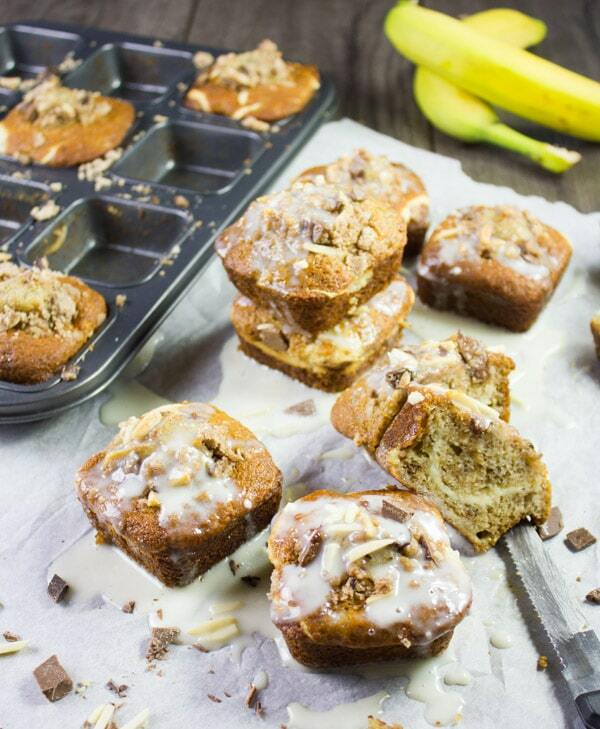 I absolutely LOVE these cream cheese banana muffins! This looks incredibly delicious! Love this banana flavor! 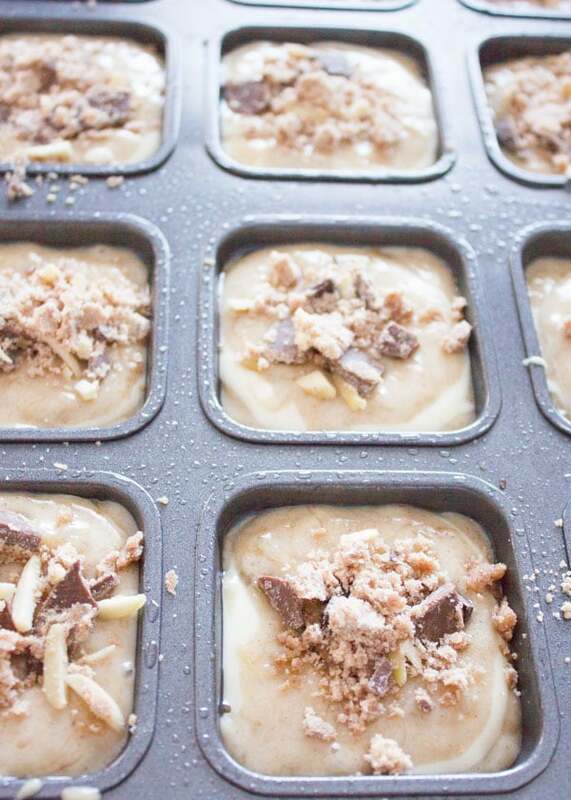 hahaha I love that square muffin pan!! These muffins are a must try Patricia!